There are many types of chopsticks available out there, but I found rather more unique ones from news website the other day. 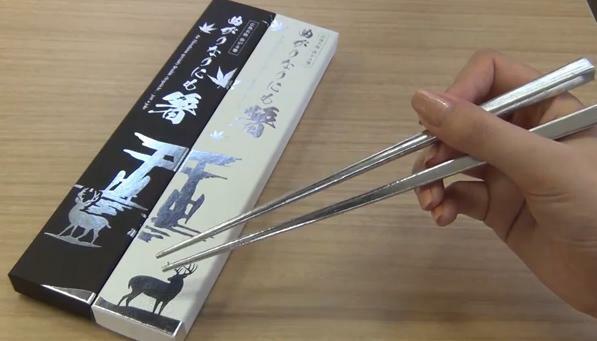 The chopsticks are called ‘Magarinarinimo Hashi (3,980yen=US$50)’, which means ‘it is somehow chopsticks. It does look very normal; however, it is made of tin. So it bends as you use. Here is an official movie of the product. This movie is full of catch-phrases with humor, and actively advertises this product as ‘chopsticks to confront reason d’etre of chopsticks’, ‘chopsticks to attract others’, and ‘chopsticks to be slim or patient’. The movie is not just funny, but also practically explaining how to straighten the bended chopsticks again. ES Corporation, which developed this product, has been encouraging their employees to spend 5% of their working hour for planning what each employee is interested. And this policy created such an interestingly unique product. Don’t you want to use it?